Wow! Mark is letting me write my own blog posts. 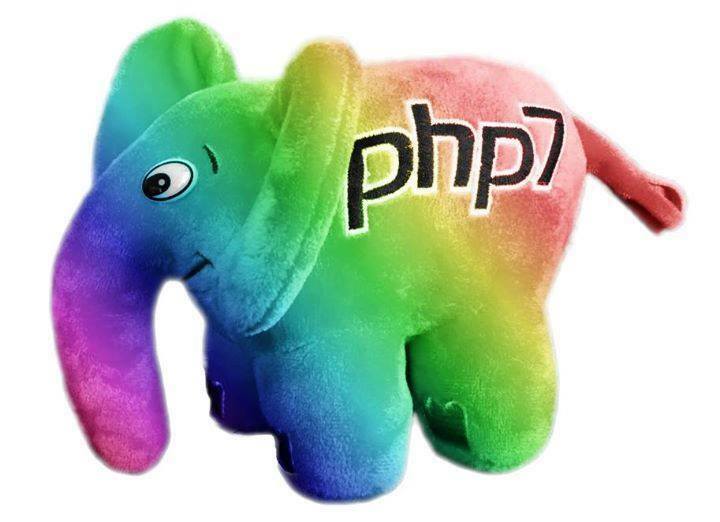 For those of you who don’t know me yet, I’m Enfys, the PHP Diversity Rainbow Elephpant; or at least, I shall be when I’m real. At the moment, I’m just a virtual Elephpant, an idea inpired by a photoshopped picture by Peter Kokot (a Slovenian developer); but someday soon I hope to be a real Elephpant, and join the PHP worldwide herd. And yesterday, my dream came a step closer to reality. Yesterday, I heard that the company that actually manufactures all the real Elephpants believed that they could recreate my colourful rainbow patterning using some kind of heat transference process. It’s all a bit technical for me, apparently a technique for dying a white/neutral material to the right colours in the right pattern. I’d been reading on the interwebz that the gestation period for an Elephpant is 95 weeks, which is a really, really long time; but now that the factory think that I can be made, Mark has ordered a prototype… and the manufacturers reckon that it will only take a week or so to see if a real me can be made using this heat transference process. Mark think that a couple of weeks is highly optimistic; but it sounds to me as though it might be a big step along my road to becoming a real Elephpant. This is great news. At the very least, there will be the prototype me, which is close to being real… but what I want is to be produced on a larger scale, so that everybody that wants me will be able to buy me. And if the prototype is good, and the price for making lots of me isn’t too high, then I can be available as a PHP Diversity Elephpant for everybody. The only drawback is that they’ll need to make at least 1,200 of me (which is a very big number), so it will only be possible if lots and lots of people want to make me real and own me. If my prototype is right, and I’m not going to be too expensive, Mark says that he is going to run a “kickstarter” so that people can order me; and if enough people want me then, there will be enough of me made to go round… and any profits made will go to help fund Diversity scholarships at conferences around the world. I think that’s a very worthy goal. So if you are interested in owning one of me, keep any eye out for my future blog posts here, and to the posts on my twitter account, and I’ll keep telling you about all the exciting things that are happening to me. This post transferred from a post originally made on the blog site at markbakeruk.net on 9th June 2016.